At your next party, elevate your presentation game with a well-designed platter or serving tray. This assortment includes sophisticated marble and stone platters, colorful printed trays from Marimekko, simple wood designs, and more. 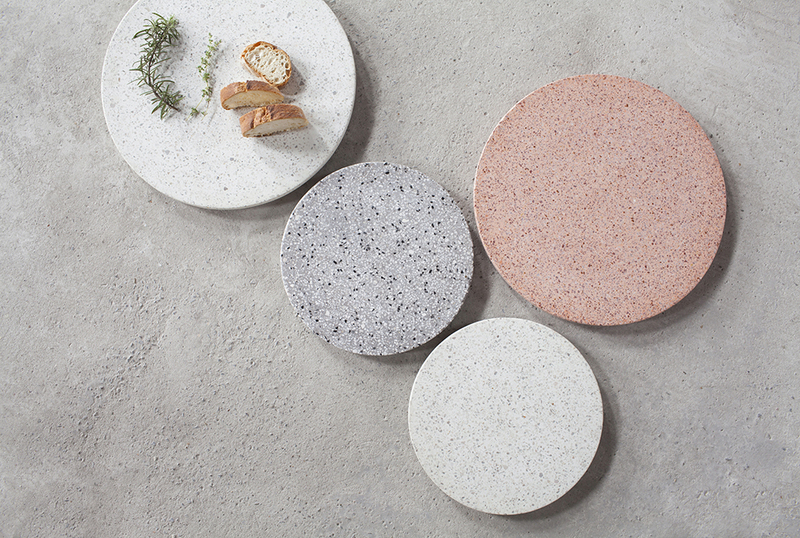 The Terrazzo Platter from Serax is a sophisticated kitchenware accent, and can be used as a serving tray, board for cheese and charcuterie, or even as a centerpiece on a dining room table—it can present tea lights, a vase of flowers, or center another accent. Terrazzo is a composite material that is available in a range of colors and tones and features a distinctive speckling. This cheese board from Brooklyn Slate is a one-of-a-kind serving platter that is locally sourced from co-founder Kristy Hadeka’s family quarry in upstate New York. Each slate is hand-selected before being carefully sized and shaped by Hadeka and co-founder Sean Tice. In order to be sized and shaped, each slate is chipped by hand, ensuring that no two cheeseboards are exactly the same. Perfect for entertaining or simply admiring, the Juhannustaika Round Plywood Tray from Marimekko is as spacious as it is enticing. Richly hued watercolor patterns reveal organic forms from designer Aino-Maija Metsola. The pattern has been taken directly from original Marimekko fabric, which gives the tray a brilliant visual texture. The Duo Serving Tray is an innovative serving piece comprised of rich walnut wood and elegant Carrara marble. Inspired by materials and shaped used in Bower NYC’s furniture line, the Duo features a marble circle that perfectly nests into the walnut board, creating a complete, unified form. Both of the materials used in the tray are ideal for preparing and serving food, and can be separated into two pieces for different functions. Taking the classic silhouette from its anodized aluminum tray, Kaymet elevates the look and function with its Rosewood Lap Table. First designed in 1965, the Lap Table includes two side handles for easy transport and folding legs that make the serving tray into a table in one easy step. The Rosewood Lap Table is constructed in gold tone anodized aluminum with a luxe rosewood tabletop, making this utilitarian accessory elegant and refined. The Ray Long Board is characterized by its use of geometric shapes and angles. Designed to be used to present bread, cheeses, charcuterie, and other small appetizers, the board features beveled edges that make it easy to pick the board up off of the table. The top of the board is etched with a series of lines, which create a graphic visual statement of angles and intricate shapes. Handcrafted in Chicago, the Doppio Serving Tray from Felicia Ferrone is a centerpiece, serving board, and tray, all in one elegant design. Comprised of two sides—one in white Carrara marble and the other in black Nero Marquina, the Doppio Serving Tray can be used to present cheeses and charcuterie, showcase candles or flowers, or can be used as a serving tray for cocktails or snacks. A collaboration by renowned designers Sebastian Wrong and Richard Woods, the Wrongwoods Tray is a distinctive serving tray with a bold pattern and functional details. Created for Established & Sons, the tray is crafted from plywood and features a playful, colorful palette that lightens the density of the wood pattern within the tray. The Wrongwoods Tray includes two handles on either side, making it easy to transport. The Turning Tray was originally designed by Finn Juhl in 1956. The original trays are now on display at Finn Juhl’s Carlottenlund, Denmark home, which is now a museum. ArchitectMade has relaunched the Turning Trays by creating exact replicas from Juhl’s original drawings. Each tray features many of Finn Juhl’s characteristic design elements, including curved teak frames and the corner joints. The Stackable Fruit Bowl from French company adónde is a modular serveware piece that can be used as both a fruit bowl and a flat serving surface. The interior of the bowl features a lichen-colored, food-safe interior, perfect for displaying fruit. When flipped over, the base of the bowl can be used to display charcuterie, cheeses, and other hors d’oeuvres.